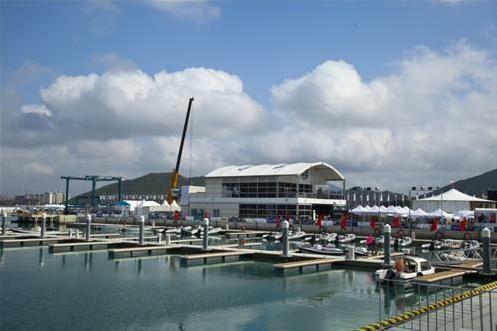 Sanya Luhuitou Peninsula Yacht Dock, the main port for the Volvo Ocean Race 2011-12 Sanya Stopover, stepped closer to an international top-class yachting port after a raucous welcome for VOR yachting teams. In order to welcome the world’s largest sailing event, Sanya Luhuitou Peninsula Yacht Dock has been built into a professional yacht dock with over 300 full-service berths from 8 to 50m (LOA) and more than 200 equipped guest rooms after 15 months construction. With the advantage of building the “international tourism island” in Hainan, Sanya Luhuitou Peninsula Yacht Dock steps out by its abundant seashore resources, which is corresponded to the Volvo Ocean Race. Fan Hong, the executive director of Sanya Luhuitou Tourist Area Development Co., LTD, said that the Luhuitou Peninsula Yacht Dock will build more supporting facilities in the near future, including culture, education, sports, business, and recovery centre.